Little Good Harbour Barbados is beautiful small resort set in a charming cluster of luxury beachfront cottages nestle amidst lush tropical gardens... overlooking the Caribbean Sea on the pristine North West coast of Barbados. One of the last family run resorts on the West Coast this luxury resort offers easy access to some of the most thrilling scuba diving and snorkeling on the gorgeous Barbados west coast. Located in the quiet fishing community of Shermans Little Good Harbour offers guest luxurious living at its finest. Its oceanfront restaurant the Fish Pot provide dinners with delectable cuisine which include a variety of sumptuous seafood dishes. This unique little hotel offers a truly relaxed, uncomplicated setting in charming surroundings. This is a welcome alternative to the typical resort properties located throughout the island. You can read guest reviews about Little Good Harbour hotel in Barbados. Fort suites with their breathtaking views of the spectacular Caribbean Sea. The Fort Suites are located directly on the water’s edge with a beautiful deck overlooking the Caribbean Sea. The lush private garden leads directly to the white sandy beach, that's perfect for sunbathing or swimming. 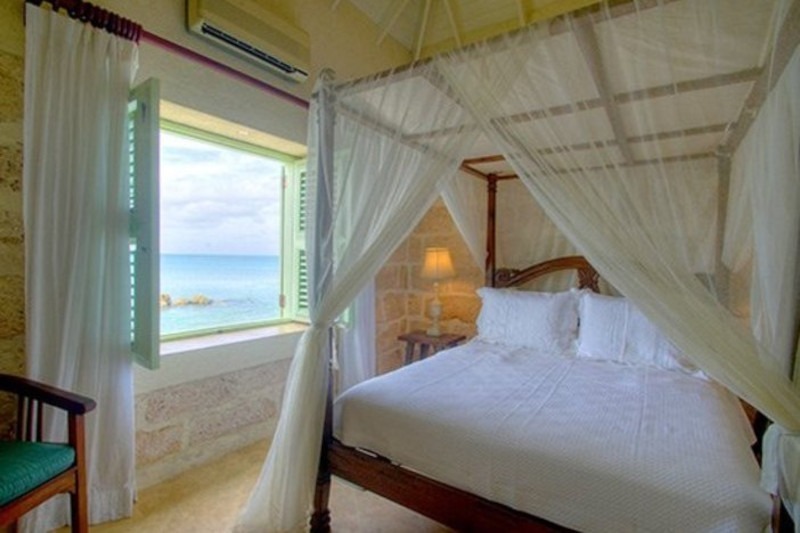 Read guest reviews about the three bedroom Oceanfront suite at Little Good Harbour in Barbados. The one bedroom garden suite at Little Good Harbour has a split-level floor plan, with the living area and an equipped kitchen with fridge, stove, oven and microwave on the lower level. This open living space leads on to a spacious outdoor patio overlooking the tropical gardens. The bedroom is located on the upper level, featuring a reading balcony. Two Bedroom Fort Suite at Little Good Harbour feature a tropical chic decor which is complimented by the uninterrupted views of the spectacular turquoise waters of the Caribbean Sea. This two bedroom suite is located on the upper level of the historic fort and has an outdoor terrace comfortably furnished for both relaxing and al fresco dining; the interior living areas are light, airy and spacious..
eighteenth-century fort. Located on the waters edge this informal restaurant offers magnificent views of the ocean from its open terrace. The Fish Pot Restaurant offers a gourmet dining experience in a relax ambience that is enhance by the enticing menu. The menu offers many mouth-watering dishes fresh from the sea, for starters you can treat your self to Marinated Lobster Salad with marinated olives, mushrooms, red onions, peppers, brioche croutons and an anchovy dressing. The Fish Pot Restaurant specialise in International, Italian, Mediterranean and sea food cuisine. Dining takes place both indoor and outdoor with this restaurant serving breakfast, lunch and dinner. Little Good Harbour can arrange your destination wedding whether its a small intimate wedding for two or a larger more elaborate ceremony followed by reception dinner. Weddings packages at this luxurious resort are specially customized to meet all your wedding needs. So if you are thinking about sharing your special day on a sun drench paradise. Surrounded by lush tropical gardens and spectacular views of the pristine Caribbean sea. The hotel will put you in touch with a wedding coordinator or planner to add the right personal touches you have always dream about. These include entertainment, flower arrangements and photography. To book the best rates for your special Little Good Harbour Barbados holiday enter your information into the search box below. This special Booking engine will search all of the popular booking sites and bring back the best rates. If on the other hand you would prefer to read what other guest to the popular Little Good Harbour had to say about their stay. You may Click Here to read their reviews and recommendations on Booking.